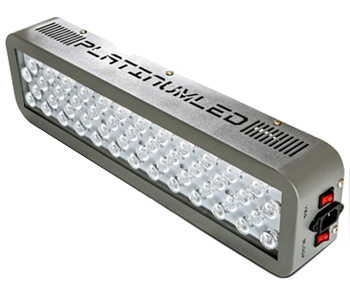 As its name suggests, this is a Platinum LED light and for the longest time, platinum lights have been rated highly for their high PAR (photosynthetic active radiation) which actually gives three times the brightness of the other LED lights. This is why we thought the Advanced Platinum Series P150 150W 12-Band LED Grow Light is worth the money that you will pay for it, not that it is costly, but that you will have a grow light that your plants will love more than they would love the natural sunlight. I looked this grow light over in other forums and I saw they referred to it as the next generation of grow lights. Well, the future is here then. What benefits can you look forward to with this light? Its platinum! That is why it is covered by a 5-year warranty. That is not all. You also have 90 days to decide whether it has satisfied your needs or not. If not, you can return it and get your money back. What does this tell you? It tells you that the manufacturer is really confident in this product and thus he backs it up with a huge guarantee. That is right. While this lamp consumes low power, just 87 Watts, it will give a full output of brightness that has been established to enable your plants to have a full photosynthesis process. All the light produced here will be useful to the plants and will enhance the production of chlorophyll and carotenoid which will improve the growth process and the health of the plant. There is no use having a grow light that will give perfect brightness and at the same time make your little greenhouse feel like an oven. The heat sink design of this grow light will dissipate all the heat even after many hours of use. Then there is the 2x quiet fans that help in keeping the grow light cool after extended use. From the UV to the IR, this grow light comes with a deep blend of all of 12 bands to give your marijuana just the ideal light spectrum that it needs to grow robustly. The lights are combined with 90 degree support focusing lenses that will pierce through the green canopy of your plant leaves thus getting the light even to the shorter plants. The Advanced Platinum Series P150 150W 12-band LED grow light will increase the yield and the quality of your plants. This grow light will cover an area of 4 feet 5 inches by 3 feet 5 inches. However, there are two switches in this light for different stages of growth. For example, for the vegetative stage, you should set the light at 50 watts and for the flowering stage, switch it for 87 watts – the full capacity. Let us say that for a grow light that a manufacturer gives a 5 year warranty, it is going to last many hours of use. It is rated at 100,000 hours. This should give you more than enough value for your money, totaling more than 12 years of use. That is right – no special ballast needed. It comes ready to plug and use. Just plug it into the wall and light it up and start growing. For all of the above-mentioned features and benefits, and the fact that customer service is available 7 days a week, 100,000 hours of life and more, you can buy the Advanced Platinum Series P150 150W 12-band LED grow light without hesitation especially if you are planning to grow marijuana, herbs or vegetables indoors for a long time to come. Gorilla Grow Tents vs Secret Jardin: Which Grow Tent is Better?